to every other aspect of life. From Poor Lil Mose, who was created by the same cartoonist as The Yellow Kid himself, to Walter Lantz's Li'l Eightball, "racist" cartoons have become notorious in these more sensitive times for their supposed offensiveness. Yet, offense was seldom, if ever, intended by them; nor, back then, does it seem to have been taken. It's possible no other cartoon about racial stereotypes ever achieved the notoriety of Coal Black & de Sebben Dwarfs, the Warner studio's parody of Disney's Snow White & the Seven Dwarfs. To this day, despite its near-universal critical acclaim, the studio's corporate heirs are too embarrassed to re-release it so modern audiences can judge it for themselves. Coal Black was the title of the cartoon, but not the name of the protagonist. She was So White, and the film's working title was So White & de Sebben Dwarfs. But that seems to have sounded a bit too much like Disney's trademarked title. Studio execs ordered it changed for its release on January 16, 1943. She's still called by her correct name in the script. So lived with her wicked stepmother, Queenie, who was so jealous of So's nascent romance with Prince Chawmin', she (Queenie) ordered her (So) rubbed out. But So so charmed the guys at Murder Inc., they let her go in the woods. She took refuge with seven little guys who lived together in a tent, as Army buddies. Queenie tricked So into eating a poisoned apple, sending her into a death-like coma. Prince arrived to pour on the kiss power, which had exactly the effect expected in a parody like this. Practically everybody who has seen this cartoon seems to have liked it, tho some have deplored, in modern terms, the height of its consciousness. The single word most often applied to it is "energetic". Second-most is probably "hilarious". 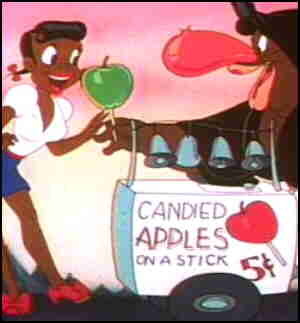 The cartoon was directed by Bob Clampett (Tweety, Beany & Cecil), who, a few months later, released another Disney parody, A Corny Concerto, this one a send-up of Fantasia. Clampett made an effort to use black talent such as Eddie Beale to compose much of the score. He also took his staff out for a night at black clubs, to show them what kind of appearance, movement and especially music he was looking for. For voices, he chose Vivian Dandridge as So White and her mother Ruby as Queenie. Prince Chawmin' was Leo "Zoot" Watson. None had any other credits in animation, before or since. But Mel Blanc, who did all the minor characters, had enough animation experience, with voices from Porky Pig to Henery Hawk already to his credit, for them all. Most Warner Bros. cartoons, from Bugs and Daffy on down, have become almost stultifyingly familiar to cartoon buffs from their long presence as reruns on TV. But not this one. Text ©2008-10 Donald D. Markstein. Art © Warner Bros.